Available in Metal Halide and High Pressure Sodium. 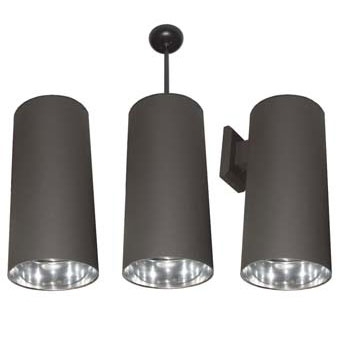 Available in 6” and 8” diameters 6” units accommodate lamping up to 70W and 8″ up to 100W. Surface mounting is standard. Optional stem and canopy mounting hardware include 3/8” I.P.S. 12” stem with 0-45 degree swivel canopy. Optional wall mounts come as a one-piece cast aluminum arm with access plate. Heavy gauge, extruded aluminum, rolled and seam welded. 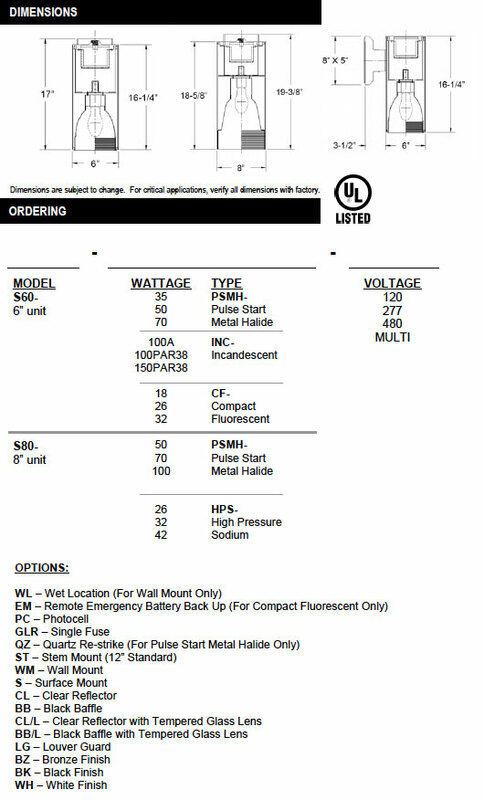 For metal halide lamping ballast is high power factor, constant wattage auto transformer. For high-pressure sodium, ballast is normal power factor reactor type for 120V. High power factor, multi-tap, and most fixed voltages available. Spun aluminum .040” thick, polished specular alzak. Standard in urethane polyester powder coated bronze. Optional black or white finish is also available.